I am just getting started with my family tree. My parents and 3 children left New Zealand for Australia in 1948 ( I think). 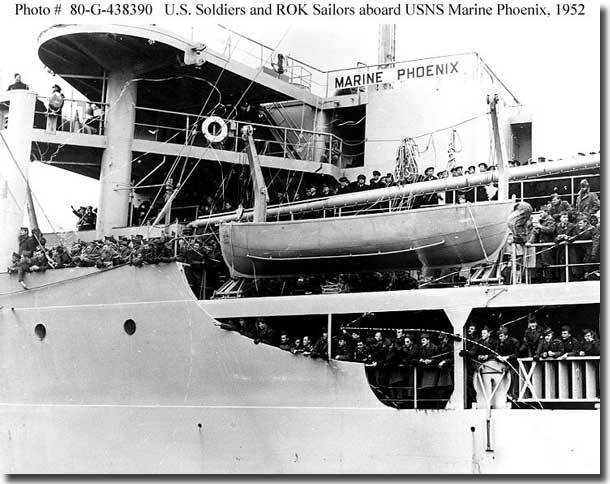 We sailed in a Liberty ship named Marine Phoenix. I have some info on Liberty ships in general, but was hoping to fine tune the detail to the specific vessell. Would appreciate any info or re direction you can offer. Thankyou for receiving this mail and any info that may be forthcoming. By coincidence, we are just back last night from a visit to New Zealand, I will see what I can unearth about your Liberty Ship Marine Phoenix, and will be in touch soon. Your question gave me a real challenge. Marine Phoenix is not listed under a total list of Libery Ships, I then tried the Victory Class thinking she may have been built under that programme, not at all, not listed again. I then turned to Troopships built or used in WW2, and at last found her. She was launched on the 9th. of August in 1945 by the Kaiser Shipyard at Vancouver Washington. 12,420 tons, 523 feet long with a 71.2 foot beam. One funnel, engine aft with a single screw and a speed of 17 knots. Built with accommodation for 3,800 troops. The ship was thus too late to play any part in WW2. Troopships were operated by Army Transportation Service with civilian crews, by the US Navy, or by the War Shipping Administration. The ship was managed by the Moore- McCormack Line for the US Maritime Commission. Her maiden voyage on the 12th. of December 1945 was from Seattle to Nagoya Japan. She seems to have carried troops from Japan to Tacoma WA over the period 5th. of January/ 17th. of January 1946. My report states she was laid up in Suisim Bay at San Francisco in 1947, but you thought your family sailed in her in 1948, perhaps that was, in fact in 1947, before the ship was laid up. It was not until the 21st. of July 1950 that the ship was commissioned by the US Navy ( as T-AP 195 ) after the Korean war started. In November of 1958, she was again laid up, this time in the Columbia River, she languished there until 1967 and was sold to Mohawk Shipping Inc, and then rebuilt as a 10, 625 ton gross cargo ship at Jacksonville, and renamed Mohawk. On the 15th. of September 1979 your ship arrived at Kaohsiung Taiean for scrapping. I could not unearth a photograph for you, but perhaps Dennis you should try the Kaiser Shipyard records, if you can find them. I do hope this info is of some value for you in your task of putting together your family details. Someone asked you about the Marine Phoenix. I came here to Australia from San Francisco on that ship. Landed here with my parents in Feb 1948. photos etc are available on http://yohidevils.net/misc/ships/phoenix.htm. Thank you for taking the time and effort to contact me about the Marine Phoenix, it was very good of you. 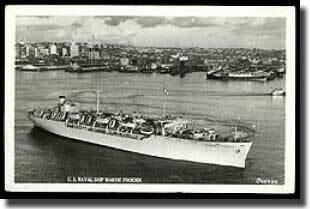 I too sailed as a kid on the Marine Phoenix from the USofA to Australia I have attached 3 pics of the ship and a postcard. You may like to pass them on. My thanks for taking the trouble to E-Mail me with the photos etc about Marine Phoenix. I appreciate your help. Letter on your site from Dennis Worledge refers to Marine Phoenix. (Which can be found on Web search)...Navy sez it was moved to Seattle in 1947. That was late in the year...it had served as a passenger ship during 1947, transporting military & civilians from San Francisco to Sydney Australia. I no longer have the details for Dennis Worledge, but he may visit AHOY again and pick up these details. My mother in law Kathleen (Kitty) Emmanuel (Previously Beach) now 86 years old emigrated to New Zealand in 1947 on The Marine Phoenix. Having heard that some others had posted some recollections on your web site thought the following might be of some interest. ‘At the beginning of August 1947 my husband Tony, baby Sally(10 months) and myself left Southampton on board a Holland America Line ship bound for New York, where we stayed for two or three nights. We then caught a train to San Francisco before embarking on the infamous ‘Marine Phoenix”. I, with Sally, was allocated two bunks in a cabin housing 20 or more women. I had to raise Cain, as they say, to get a railing put up at the side of Sally’s bunk; otherwise there was a very real danger she would fall out. Tony was given a berth with 11 other men. one of whom disappeared during the voyage. No one ever knew whether he was pushed overboard or just fell, nothing was done for at least a couple of days – far too late to ever find him! The dining facilities were laughable. Long trestle tables – no tablecloths or napkins, very primitive. The food wasn’t much better. Other facilities too were very basic – 4 loos for we women and lots being sick when the sea was rough. To bathe my baby I had to fill a tiny bath and carry it back to the cabin. Not easy with a rolling ship! Another difficulty was the rampant whooping cough that affected most of the children, but thankfully not Sally. Our first stop was Pitcairn where the locals came out to the ship on long boats and swarmed up the sides on rope ladders, and then tried to sell their beads and trinkets to the passengers. We would loved to have gone ashore but that apparently was not possible. On top of this most of the crew were drunk during the whole voyage! And all this for first-class fares! After trying hard to find a place to rent, Tony managed to find a small flat in St Stephens Ave, in Parnell. Unfortunately when the landlord discovered we had a small baby he asked for the deposit back and didn’t want to let the place to us, which of course was against the law, as he well knew. We stayed for just enough time to find a place to buy in Takapuna. A lovely spot 500 yards from the beach. 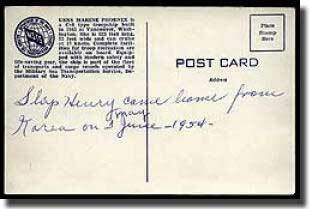 Perhaps you could bring this to the notice of some of those who travelled on the Marine Phoenix in September 1947. Sounds a rather unpleasant experience.